Hi there, welcome to stepmum’s! 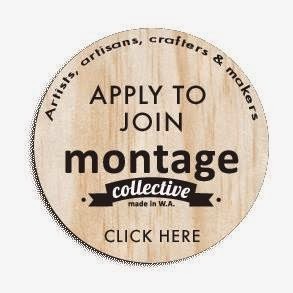 We are happy to join the Montage team as guest artists in this year’s first pop up shop. All our products are handmade either by me, Lena or my husband Rainer. We started our business back in 2004 after we emigrated from Europe to Australia. Perth wasn’t in desperate need of German actresses so I had to find my little niche. At that time I had a market stall with our first and then only product wallets made from milk cartons. My stepmother had shown me how to make them and was a great companion in discovering the beautiful world of recycled goods. She is honoured in our business name “stepmum’s”. I love to play around with new materials. One that particularly appealed to me was vinyl records. It is so much fun, you can do almost anything! I like that the material itself has a story. The music is still on it we just can’t hear it, or can we? I gradually increased our vinyl range and now we have clocks and bowls, cake stands and pencil holders, even bags! We also recycle the covers into postcards. The cheesier the cover is, the better the card. All our price tags and business cards are from recycled covers as well. In 2007 Rainer was hooked by the whole recycling idea and added his fantastic inner tube products to our range. He makes bags and pouches from truck tubes and seatbelts. Sometimes when great ideas emerge you wonder why you didn’t come up with them earlier. Where else should you have a bag made from a truck tube? When we go to the tyre places to source our tubes it’s like going on a treasure hunt. They can have all sorts of pattern and prints. Sometimes we find one that has been mended with patches multiple times and we wonder where the truck has been? Wouldn’t it be great to know? All the materials are sourced locally. The ‘green’ aspect of our business is very important to us but it is equally important that people buy our product because they like the design and find it useful. Although our stuff is retro and quirky we try to go beyond being a gadget. We both produce at home (between our various other jobs) and the best moments are when we find time to work on new ideas. We also both agree on the big disadvantage when working with recycled materials, the cleaning! We both hate it! But the magic transformation from this big smelling rubber pile into those immaculate shining satchel bags is worth the effort. It is very encouraging that after almost ten years people are still exited and inspired with what we are doing. Stepmum's will be in store at Montage until the end of this week.